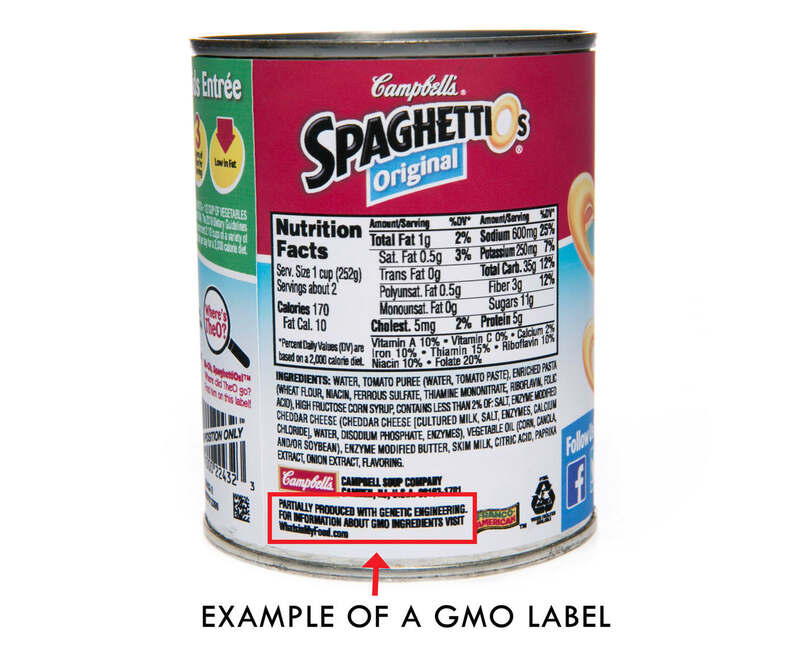 This is how Campbell’s GMO-containing are labeled in Vermont. The language used on its eventual nationwide label may end up being different. While some large food producers contend that mandatory labeling of products containing genetically modified or genetically engineered ingredients would be a burdensome and unnecessary requirement, the folks at Campbell Soup Company have decided to not only voluntarily label their GMO-containing products but to publicly support mandatory GMO labeling. About 75% of Campbell’s products — in addition to its namesake soups, Campbell also makes brands like Pepperidge Farm, Bolthouse Farms, Arnott’s, V8, Swanson, Pace, Prego, among others — use ingredients made from corn, canola, sugar beets, or soybeans. Almost all of the farmers producing those crops in the U.S. use GMO seed. So for a company like Campbell, there’s no way it can simply stop using GMO ingredients and still produce the quantity of product that its customers demand. In fact, the company has no intention to make such a change because it maintains that GMOs have been repeatedly proven safe and that they may be needed to meet the increased demand for food around the globe. So if Campbell contends that GMOs are safe and necessary, why does it support nationwide mandatory labeling? Because 9-in-10 consumers want to at least know whether the foods they eat contain these ingredients. Campbell cites that figure — from a survey conducted by our colleagues at Consumer Reports — as evidence that American consumers have a desire for more transparency from the companies that produce their food. Campbell has fought state-level GMO labeling requirements in California and Oregon, arguing that labeling regulations that vary from state to state create a patchwork that is too complex and costly for large food producers to deal with. Instead, it believes that a national GMO labeling standard would be best for everyone. Campbell currently labels its products sold in Vermont like the soup can shown above. Below the ingredients list, it includes a disclosure stating something like “Partially Produced With Genetic Engineering,” directing consumers to its whatsinmyfood.com site for more information, including a list of the various GMO ingredients it uses across its range of products. The company tells the NY Times that it will be working with the FDA and other regulators to craft the language for standard, nationwide GMO label for its products. Jean Halloran, Director of Food Policy Initiatives for Consumers Union, applauded today’s announcement. “Campbell Soup has taken an immense step forward today. Their decision to disclose which of its ingredients are genetically engineered will give consumers the information they want and deserve, even going beyond what’s required in Vermont’s labeling law,” says Halloran. A similar sentiment was voiced by Connecticut Senator Richard Blumenthal.